Some inaccuracies regarding teachers and dyslexia were put forward recently by Jason Gauci in the Times of Malta (November 16, 2007). This article sets out to clarify some misunderstandings and outlines some of the work presently undertaken by the Specific Learning Difficulties (SpLD) Service. To begin with, it is pertinent to state that the SpLD Service is appropriately placed within the Curriculum Department of the Education Division. It is access to the curriculum which is the Service's primary and major preoccupation. Contrary to what was stated, the Education Division is committed to supporting and advocating the appropriate support for dyslexic individuals of whatever age. Moreover, it is totally unfair to state that the Ministry of Education is not "prepared to invest money in addressing the problem". Indisputably, the SpLD Service could benefit from an increase in funding. However, over the years the service has been enabled to considerably extend its resources, teaching programmes and software. In fact, the SpLD Service can be considered to be on a par with any centre of excellence in the UK - it boasts of the appropriate teaching materials and resources for those encountering literacy difficulties. Over the years, numerous enthusiastic Heads of school, teachers, specialist teachers and facilitators have benefited considerably from their visits to the SpLD Service which allowed them to get a good overview of the multi-sensory resources currently in use by the SpLD team - resources which are essential for a dyslexic individual but which also enhance the learning opportunities and increase motivation of those who might not be performing at mediocre levels. Furthermore, this year the Curriculum Department has sponsored the post-graduate teaching certificate, run through the University of Malta, to identify and teach dyslexic individuals. Such a course allows participants to have up to date knowledge of specific learning difficulties and to better understand the unique needs of the Maltese bilingual dyslexic child. This course is again indicative of the support dyslexic individuals are now starting to receive in the way of funding and commitment. Though the group of teachers is restricted to 15 it is professional training, within the local context, which can lead to enhanced support of dyslexic individuals. The SpLD staff has also been involved in a number of EU projects which have allowed participants to gain insights into how dyslexia is being tackled in other EU countries. For example the Grundtvig 3 Project Reading And Writing Difficulties In Adults is aimed at bringing the literacy difficulties encountered by adults to the attention of employers and to suggesting how they could be more constructive or proactive when encountering employees who struggle with literacy skills. The Dypatec project led to the production of a manual for parents. Work on the adaptation of the manual in Maltese is now almost complete. Furthermore, as a result of a Leonardo Project two teachers spent a two-week period in a special school in the UK. 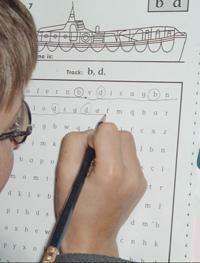 This allowed them to observe the methods employed in an environment which caters solely for dyslexic children. The SpLD Service also accentuates the importance of supporting parents working with dyslexic children. During the various meetings and seminars, parents are instructed in multisensory techniques and various practical, hands-on activities. The dissemination of such information empowers parents to take a more active role in contributing constructively to meeting their children's needs. Over the years the SpLD Service has always attempted to organise some activities to bring dyslexia to the attention of the public. Activities have so far focused on strategies leading to successful literacy development, parental support, adults in the work place, and building partnerships. The President of the European Dyslexia Association, hosted by the SpLD Service, had also contributed to one such activity. This year the SpLD Service again organised an activity for heads of school or their interested representatives to commemorate Dyslexia Week. The objective of the meeting was to give educators a good overview of the multifaceted work of the SpLD Service. This includes: assessments and screening, structured multisensory teaching, school visits, liaising with schools, EU projects, staff training and parental support. Educators present were first invited to view, trial and inspect the resources, games and manipulatives specially designed to accommodate those requiring more varied techniques for the development of their literacy skills. What was perhaps more unique and special about this activity was that the SpLD staff illustrated by means of a DVD, the strategies they are currently using for teaching spelling and reading techniques. In fact, the DVD produced especially for the Activity illustrated the variety of tactile, auditory, visual and kinesthetic techniques which have been implemented by the SpLD staff in different situation. Such techniques as paired reading and multisensory teaching have certainly proved to be conducive to tangible and evident improvement. It is crucial that the SpLD Service is enabled to grow and develop, to extend its premises, to support teachers and other professionals not only on the practical level but also to contribute to further examine the factors which are impeding the child's literacy development. It is essential that continual professional training is maintained for the SpLD team so as to enable all those committed to supporting dyslexic individuals to ensure that the curriculum is made more accessible. The SpLD Service looks forward to the future from a European perspective. The various partnerships established over the years can contribute to further enhancing our children's learning opportunities. Dr Christine Firman, Ph.D., is the coordinator of the SpLD Service and has worked in the field of dyslexia for several years.